Kids, light your photos properly. Colour correction is a pain..
Everyone who has asked me what I'm making for Christmas lunch gets the same answer: nothing, if I can help it. Cooking is great, but at Christmas time all I want is to relax. I want to drink a few beers, gorge myself on cheese and dips, enjoy the sun (woo Southern Hemisphere! ), and chat to friends and family, all without having the nagging worry that the meat and vegetables might not be done at the same time. But if you do find yourself in charge, you can (and should) make things easier for yourself by getting prepared. 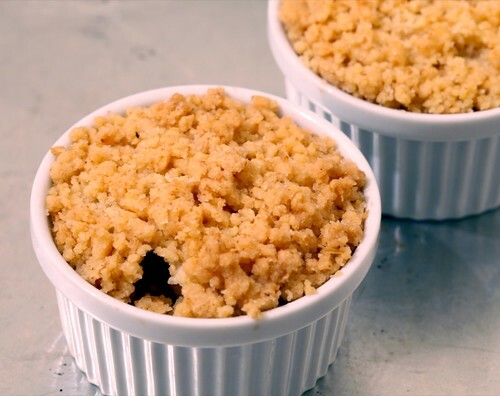 Dessert lends itself particularly well to preparation, and with these individual apple crumbles you can serve your guests dessert straight out of the oven without any anxiety on the day. Apple crumble is a favourite of mine because it's hard to unforgivably screw up. 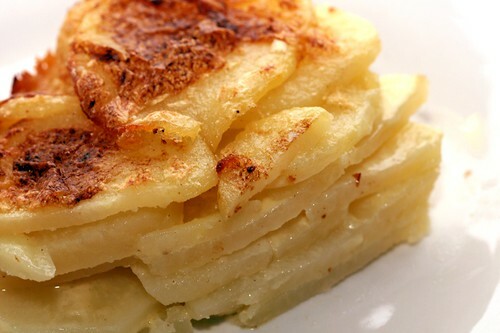 Even if the topping isn't perfectly crisp or the apples are a little crisp it's still pretty tasty (and some good custard on the side is even better for masking any flaws). A good trick I've seen involves adding oats to the crumble to boost flavour and texture. I used to do that until one day I ran out of oats and substituted wholemeal flour. With wholemeal flour you maintain the crumbly texture most people are used to, but still get that earthy, wheaty flavour you get with the oats. The best thing about this dessert is that it can be easily scaled depending on the number of guests and prepared ahead. Refrigerate the uncooked crumbles until it's time, then on the day put them in the oven an hour before you want to serve dessert. 1. Preheat an oven to 180ºC/350ºF. Peel, quarter, and core the apple, then cut each quarter into quarter-inch thick slices. Layer these in small ramekins until 3/4 full and sprinkle each with 1/2 tsp of lemon juice. 2. To make the crumble topping, place the butter, flours, sugar, and nutmeg into a bowl and combine by mashing with the back of a fork. You won't be shocked to learn that the texture should be crumbly but not completely bone dry. Taste a little to determine if it needs any more sugar or wholemeal flour. 3. Divide the crumble mixture in halves and use it to top each of the prepared ramekins. Pat them down rather firmly to ensure a compact package, then fluff the top of the crumble mixture up to ensure plenty of surface area to make it nice and crumbly. 4. These can be refrigerated now, or put straight into the oven for 45 minutes or until golden and crunchy on top. If you're cooking them from the fridge, allow an additional 5-10 minutes in the oven. My friends and I have a semi-regular thing we like to do called 'corkasian'. The premise is simple: go to one of the many bustling restaurants in Chinatown (Cafe Kowloon, BBQ City, and East Taste usually) and take advantage of their tasty asian food and criminally cheap corkage ($1.50 per person! What?!). At our first visit to BBQ City we ordered a pork belly hotpot dish that at the time was, quite simply, amazing. The pork was so tender you could cut through it with chopsticks, and the sauce was aromatic and perfectly seasoned. A few weeks later we revisited BBQ City and its famed hotpot, but it wasn't the same. It could have been the fact that I was taking an alcohol-free day, but even my more jovial tablemates agreed. Still, the seed had been planted and I have made it a personal mission to make my own delicious pork belly hotpot. 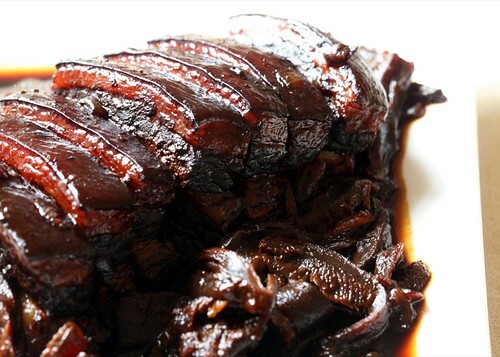 This recipe is adapted from Simon Bryant's red-cooked camel recipe. It's as simple as anything, too. 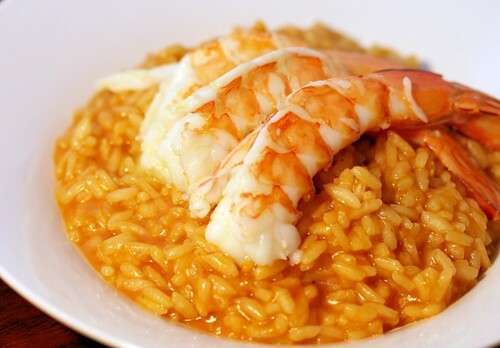 Just put all your ingredients into a pot, then say goodbye to them for 6 hours. Unfortunately it's quite hard to photograph well, but do take my word that it tastes much better than it looks. 1. Preheat an oven to 150ºC/300ºF. Select a heavy, oven-safe casserole dish that will fit the pork belly snugly. 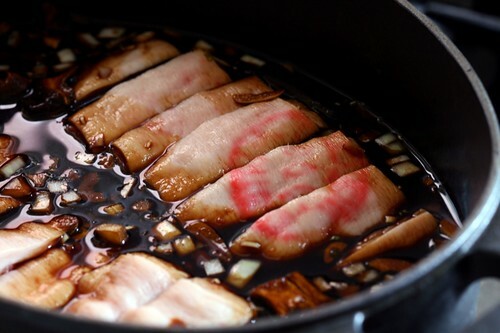 Place all of the ingredients except the pork belly inside, and stir to dissolve the sugar. 2. Submerge the pork belly in the liquid and cook, covered, in the oven for 5-6 hours. 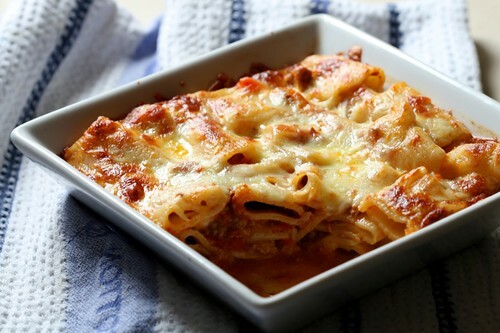 The first time I made this I ate it as is, straight out of the oven. However pork belly being what it is, a lot of fat melts into the sauce. Because the pork skin and connective tissue also produce a lot of gelatin, my usual technique of refrigerating and pouring the liquid through a strainer doesn't work here (because the sauce sets as well as the fat). Instead while the sauce was warm I strained once to get hold back the solids, then used Jen's handy method. At this stage you can also pick out the whole spices so no one gets an unpleasant surprise. So did I do it, did I recreate that first glorious meal? I'm getting there. I reduced the amount of dark soy from the original recipe by a third, but I could still afford to knock that down just a little more, adding a bit of stock to mellow things out. Also, while the star anise is absolutely crucial, two might be too much. However those are minor tweaks in search of perfection — even short of perfection this is a damn fine way to treat a belly of pork.